BALTIMORE–The Packers held off a late Ravens rally to score a 19-17 win at M&T Bank Stadium on Sunday. The win left the Packers at 3-2. The Ravens cut the Packers’ lead to 16-10 early in the fourth quarter following a 10-play, 80-yard touchdown drive. It made for another tense final quarter for the Packers. Green Bay converted a critical third-and-1 play with 10:13 to play. Aaron Rodgers completed a sideline throw to Jordy Nelson. Eddie Lacy caught the Ravens in a blitz on the next play, and Lacy broke loose for a 17-yard run. Again, the Packers faced a third-and-short play. This time, Lacy pounded out the first down. A pass to Jermichael Finley gained 19 yards and put the Packers in field goal range to widen their lead to two scores. Lacy ran twice against a fatigued Baltimore defense. On third-and-three from the Ravens 12-yard line, following a Packers time out, Rodgers threw safely out of bounds. Mason Crosby then booted a 31-yard field goal that gave the Packers a 19-10 lead with 4:17 to play. The Packers then reduced the Ravens to a last-gasp, fourth-and-21 play, but Tandon Doss got behind the Packers coverage for a 63-yard pass from Joe Flacco, who followed with an 18-yard touchdown pass to Dallas Clark. All of a sudden, the Ravens were back in the game with 2:04 to play, trailing by two points. With all three timeouts remaining, Baltimore elected to kick away on the kickoff. Lacy carried for a yard that brought the game to the two-minute warning. Tension had fully returned. Rodgers ran for six yards and the Ravens called time out. The game came down to a third-and-3 play. Roders found Finley over the middle and Finley completed a 51-yard, catch-and-run play that clinched victory. Lacy rushed for 120 yards, his first-ever 100-yard game. Rodgers completed 17 of 32 passes for 315 yards, one touchdown and one interception. BALTIMORE–The Packers held a 16-3 lead over the Ravens after three quarters of action at M&T Bank Stadium on Sunday. A three-and-out capped by a sack by Micah Hyde, a short punt and a 23-yard return by Hyde put the Packers at the Ravens 39-yard line early in the third quarter, but what appeared to be a turning point in the game in the Packers’ favor was canceled by a Jimmy Smith interception in the end zone of an Aaron Rodgers pass intended by Jordy Nelson. On the Packers’ next possession, Jarrett Boykin, playing in place of Randall Cobb (ruled out with a knee injury), caught a short pass and went 43 yards with it to the Ravens 25-yard line. 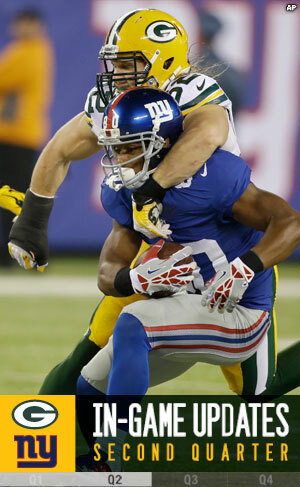 Following a holding penalty on Jermichael Finley, Rodgers faced a third-and-17. Rodgers misfired on a pass for Finley. Mason Crosby’s 50-yard field goal gave the Packers a two-score lead, 9-0. Lightning struck almost immediately. Joe Flacco completed a pass over the middle to Marlon Brown. He broke Tramon Williams’ tackle attempt and Brown went 59 yards to the Packers 6-yard line. The Packers defense held, again, and the Ravens elected to kick a field goal and cut the Packers’ lead to 9-3. Rodgers made lightning strike for the Packers on their next possession. He froze the Ravens secondary with a play-action fake and then hit a streaking Jordy Nelson in stride to complete a 64-yard touchdown pass that put the Packers up, 16-3, with 2:12 to play in the third quarter. BALTIMORE –A 31-yard FG by Mason Crosby on the final play of the first half gave the Packers a 6-0 lead over the Ravens. Packers LB Nick Perry strip-sacked QB Joe Flacco, with DE Datone Jones recovering the ball and returning it 20 yards with just 2 seconds left in the half. Crosby then made the kick as time ran out. Moments earlier, the Packers failed to extend their lead as K Crosby missed a 44-yard field goal try. That came one play after WR Randall Cobb made a catch over the middle but was hit low and injured. After being helped off, and a personal foul was marked off on the Packers, Crosby missed wide right, breaking his streak of 10 straight makes to start the season. The Packers preserved their initial 3-0 lead with a goal-line stand. A 45-yard pass to TE Dallas Clark moved the Ravens into scoring range, and they eventually had first-and-goal from the 4. But three Ray Rice runs got only to the 1, and then when the Ravens decided to go for it on fourth down — after the Packers declined a holding penalty on third down — Bernard Pierce was stuffed at the goal line and the Packers took over. Green Bay blew a chance for great field position on special teams. TE Ryan Taylor blocked a punt, but FB John Kuhn tried to pick up the rolling football and failed. The fumble was recovered by the Ravens for a first down at their own 41, and moments later Clark had his big pass play and Baltimore was threatening to score. The Packers went nowhere, however, as WR Jarrett Boykin — in the game in place of the injured James Jones — dropped a pass over the middle that would have picked up the first down. Early in the quarter, the Packers nearly had a costly turnover. Ravens DE Elvis Dumervil sacked Aaron Rodgers and forced a fumble for the second time in the game, but WR Jarrett Boykin recovered for Green Bay inside the Packers’ 10-yard line. RT Don Barclay, who is struggling to block Dumervil, had recovered the previous fumble by Rodgers. BALTIMORE–The Packers held a 3-0 lead over the Ravens on Sunday, following one quarter of play at M&T Bank Stadium. The Packers stormed out of the gate on the strength of two Eddie Lacy runs totaling 47 yards. Jordy Nelson dropped a second-down pass that would’ve likely carried inside the 10-yard line. On third-and-four, Aaron Rodgers threw incomplete. Mason Crosby then booted a 45-yard field goal to give the Packers a 3-0 lead with 13:11 to play in the first quarter. Baltimore was unable to mount a scoring threat. James Jones sustained a leg injury and his return was questionable. Rodgers completed five of nine passes for 46 yards in the quarter. Lacy rushed five times for 57 yards.